So, naturally, this miracle of life inspired my only creative outlet, cake making. I took my inspiration for this cake mostly from one I saw from the Night Kitchen in Philadelphia. This is the type of cake that makes me want to learn stuff about fondant. 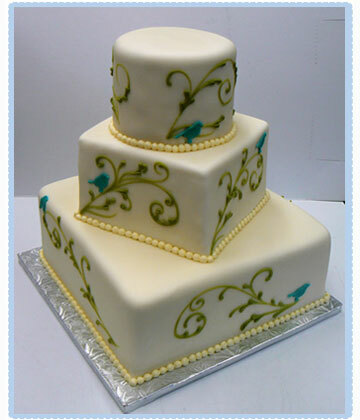 This cake also reminds me of a Vera Bradley pattern called "sitting in a tree." I used the yellow cake recipe found under the happy birthday 1 post from september 3rd and my normal wilton butter cream. The really different part about this cake is that I made it in a sheet pan and cut that into 4 squares so that I could stack them and make them into a cube. I also made chocolate ganache for the first time. DEFIANTLY WORTH IT!!! I used 8 oz. Ghirardelli bittersweet baking chocolate that was 60% coco and 2 cups cream. You heat the cream in the microwave until boiling, pour over the chocolate and let the chocolate melt. Use a wisk to stir. Then put it in the freezer until it is chilled and whip in the kitchen aid until it is sort of like dense chocolate whipped cream. UM, that is good! Next time I want to try it with milk chocolate instead. I loved this cake and I think it is beautiful. I had a hard time frosting a square, but I am going to work on that because it is too pretty to not want to. I love love this cake. When I'm rich and can actually have people over for dinners, please make me this cake.